The Netherlands was the first country to award its women's sevens rugby players pro contracts in 2011. Since then, Australia, New Zealand, Ireland, South Africa, Canada, USA, Russia, Spain and England have followed suit in the shortened form of game. The 15s game has been slow to catch up due to differences in funding models - the older format is not an Olympic spectacle, so does not have access to individual countries' Olympic funding - which is what has allowed the likes of Netherlands and Russia to dole out contracts to their sevens players. But England reached the World Cup final in Ireland in 2017 on the back of a nine-month period in which its squad members were awarded contracts that allowed them to concentrate on rugby full time. That contract deal - which is now being sold as a 'trial' - came to an end after the final. But in September, the RFU in England announced that its internationals would again be on full-time professional contracts. This time, they would be permanent. You can be sure England's big rivals New Zealand and France were watching closely - the latter had been considering pro contracts for some time, according to a report published in June. In November, between two Test matches against five-time World Champions New Zealand's Black Ferns, French rugby authorities announced its women's internationals would be awarded professional contracts. Part-time ones. Worth €1,600 a month before tax and any performance bonuses. At the risk of being accused of mansplaining why the disparity between how male and female athletes are treated should be addressed, that's a travesty. These athletes are the best the country has to offer in their chosen sport. They train as hard as their well-paid male counterparts. They play week-in, week-out for clubs in the Top 16, the women's equivalent of the Top 14. They are expected to be - and are - every bit as professional on and off the pitch as the men who earn so much more. They have numerous requests for their time from the media and other organisations. And they have to do this, as near as dammit professionally, while finding a way to pay the bills, so they can continue training and playing. It has been some year for France's women's rugby squad. They Grand Slammed their way to the Six Nations title in March. In November, on the same day Ireland's men's side got the better of the All Blacks in Dublin in a much-more publicised match, France's women beat five-time World Champions New Zealand for the first time ever. 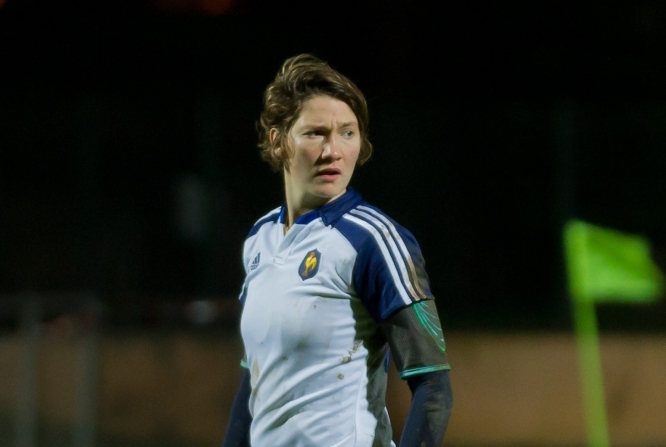 In early December, France fullback Jessy Trémoulière was named World Rugby's women's player of the year. No fewer than four French players had been shortlisted for the award. Four out of a full list of five. This is the standard that French rugby authorities have said is worth €1,600 a month. No French men got anywhere near the list for their male counterparts. There will be those who claim that women's rugby does not attract the level of support of the men's game. Such people are steadfast in their refusal to accept the women's game - to accept women's sport in general. So don't tell them that, on March 17, 2018, France played England at Stade des Alpes in Grenoble, in the Six Nations. A try in the dying minutes of a tension-fuelled encounter from Trémoulière won that game in front of a 17,740 crowd. Don't tell them, either, that France beat the All Blacks for the first time ever in a pulsating encounter at the same venue in front of 17,102 fans in November. To be honest, watching on TV, it sounded like more, such was the atmosphere. And definitely do not mention TV audiences. That New Zealand game was watched by an average of 1.3million viewers on broadcaster France 2 - or 10.8% of the viewing population at the time. The TV audience peaked at 1.8million, according to official figures. This is one thing France does well. Home internationals - men's, women's and under-20s - are broadcast free to air on main France Televisions channels, and are often scheduled at prime time. With figures like those from November, it is easy to see why the broadcaster puts in the effort. It is somewhat ironic that news of the French rugby contracts broke a week after pay-TV operator Canal Plus, to widespread acclaim, showed a live domestic women's league football match for the first time. Sport is a business. Women's sport is a rapidly growing market. And, in rugby, France boasts one of the top three women's international teams on the planet. Its athletes are not asking the world - forward Safi N'Diaye, another nominee for World Rugby player of the year and a youth worker when she's not carving up the pitch, said after the news broke: "We are experimenting. There are still a lot of things to explore. But, already, it will change a lot in our preparation." Yes, it will. It is better than nothing, of that there is no doubt. But, after England's elite players regained full-time contracts and in a country that is home to the richest domestic men's tournament in the world, is it too much to ask that these athletes are paid and treated like the professionals we consider and expect them to be?